Jessica Chastain’s long, red hair is styled in a sleek, straight hairstyle with a m..
Jessica Chastain’s long, red hair is styled in a sleek, straight hairstyle with a middle part. Jessica wore this look to the Givenchy Fall/Winter 2013 fashion show. 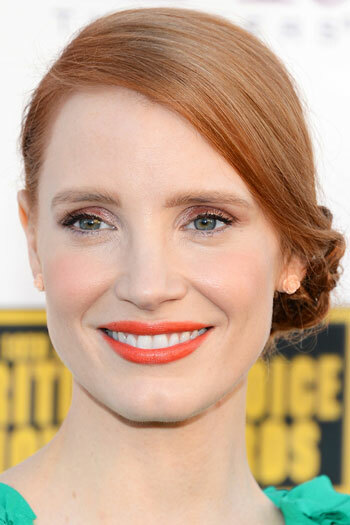 Jessica Chastain’s red, curly hair is styled in a loose, curly chignon. This roman..
Jessica Chastain’s red, curly hair is styled in a loose, curly chignon. This romantic updo is perfect for any formal occasion. Jessica Chastain’s modern bouffant hairstyle looks so ladylike, she could perfectl..
Jessica Chastain’s modern bouffant hairstyle looks so ladylike, she could perfectly fit a 60’s movie star. Looking like a glam diva might be easier than you think: brush your hair backwards and create voluminous hair and set with hair spray. Instant magic! Jessica Chastain wowed everyone at the InStyle and The Hollywood Foreign Press..
Jessica Chastain wowed everyone at the InStyle and The Hollywood Foreign Press Association’s Annual Event donning a sheer black dress and leviathan high bun. Score the look by creating a high ponytail first. Then, tease the hair a bit before twisting it and wrapping it around the base of the ponytail and securing it with pins.